BMW 3 Series E36 is an old car and does not inspire seriousness, but on the other side - E36 has a number of positive moments. The buying expediency of the 3-series of the 90s is dictated primarily by the great combination today of the price and quality. These cars do not concede many modern ones, but their price is several times cheaper. Their service is also much simpler and cheaper than stuffed with modern technologies vehicles, where their producers used to rest to the fullest with the quality. At the same time, well-kept BMW E36 does not make the owner feel an inferiority complex. 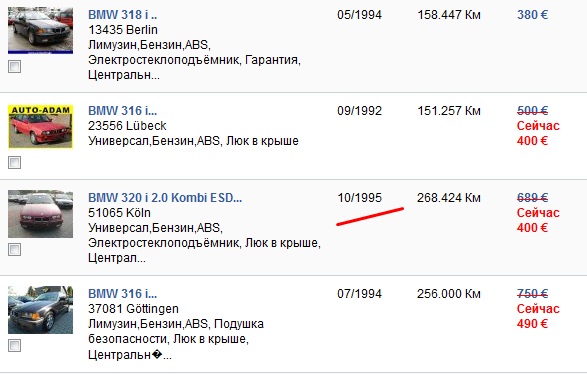 And, of couse, BMW 3series are the best cars for tuning. For the beginning let's see what can be found on secondary market, for what money and at what state. 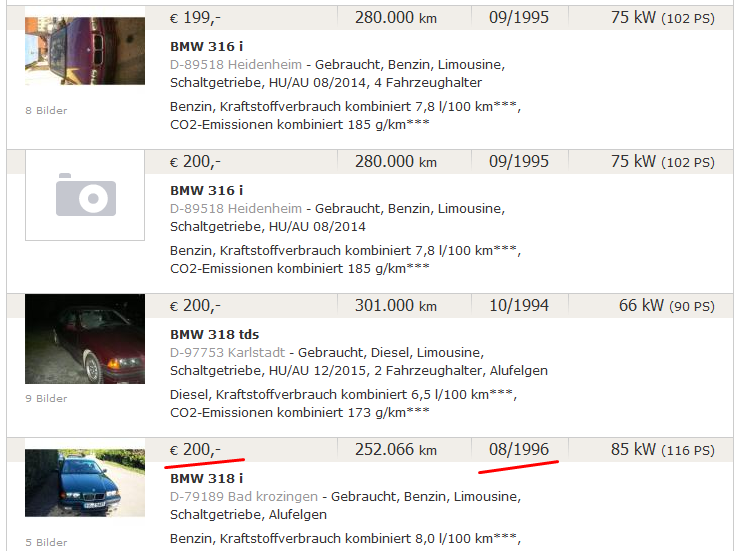 And of couse, there are different bmw 3 series prices for different countries. Numerous message boards and printed advertising brochures will show you thousands of used bmw 3 offers, which price will be distributed on a wide range of willing to sell. 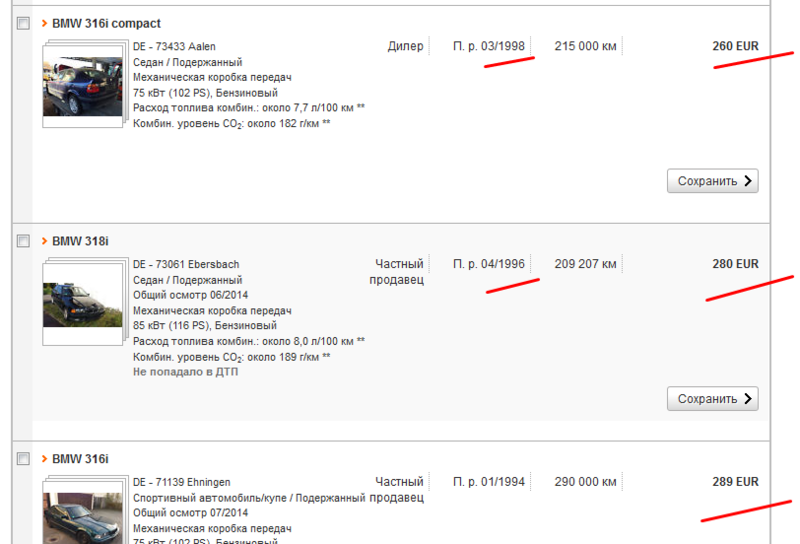 Here it should be understood that the vehicle was produced almost 10 years ago (since 1991 till 1999) in different versions (with engines from 1.6 to 2.8) and in various body models. The condition of these oldies is also different - someone takes care about a car, and others just drive without going into details. The diesel 3-series of the 90s also cost less than its gasoline counterparts. Of course, these prices are rather relative, but as a kind of reference point to understand from how much you can find not a dead option, they should be fine. The upper range will not touch - it does not influence. The cost of cars in some countries is a separate issue. Scrap on wheels from Europe, restored and with customs clearance by all the rules, this car will be sold at a price comparable with European primary market in Russia for example. That is so because the bmw 3 e36 cost of customs clearance will be much higher than the price of the car itself. At the same time, the issue of foreign prices on used cars remains relevant and the question is that there are nuances in the majority of the scheme and legislative issues that can be bypassed. 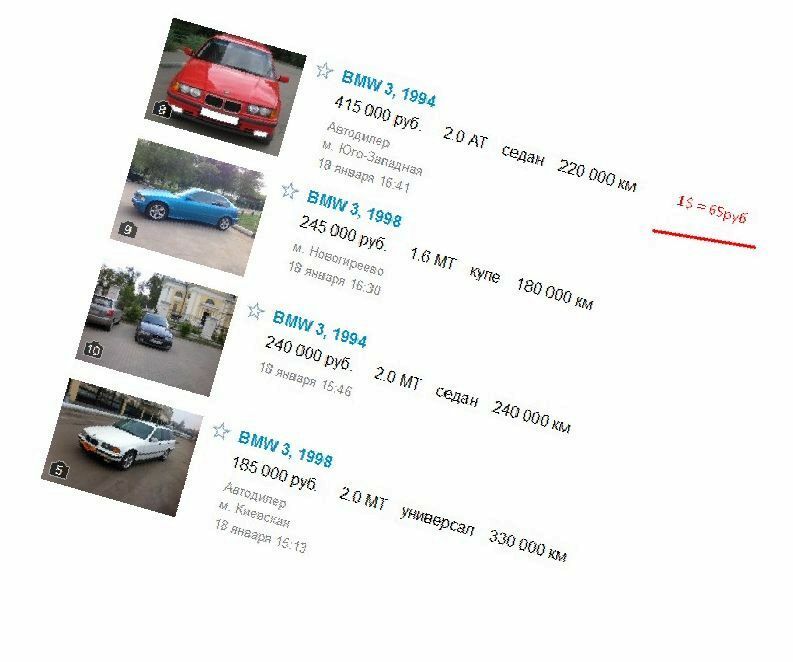 For example, if you want to change your car on the same, but more powerful, then why to buy and pay customs fees (or disposal), if you can order car kits and assemble the renewed bmw 3 e36 on the basis of your? The question here - whether you have special knowledges, if there is enough time and a suitable space for repair. There are a lot of bmw 3 series sale in Germany. But, on mobile.de and autoscout.de bmw 3 series prices are lower and the choice will be a little better. Of course, here we can talk about average prices and the minimum ones, but it is not quite correct, because we are not talking about the search and purchase of what is in storage of our dealers, and we are talking about the search and delivery custom service, which is necessary for you. The difference is significant. You have great choise in case of delivery from Germany, but at home you can take just some from available list or do not take. 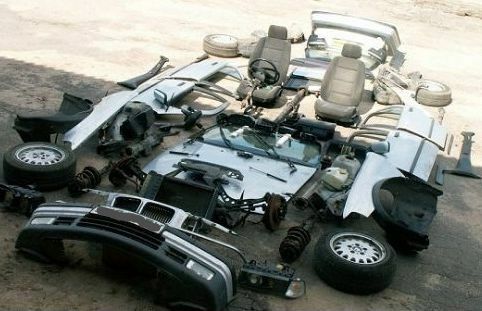 Thus, the price for bmw 3 series in the form of car kits should consist of the chosen car value, the cost of sawing and delivery services, customs clearance as spare parts and greed of your company-intermediary. It is worth to start a conversation with the companies that provide such services exactly with the last component verifying. 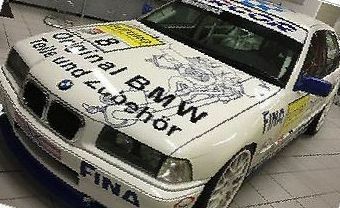 In any case, now you know how you can find offers for BMW E36 car kits.